Imprint colors available are red, black, blue and green. All prices include your imprint in one color with our standard inch scale. 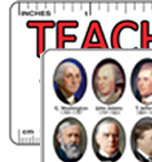 A set up charge of $10.00 will apply to all new orders and all repeat 6" & 12" ruler orders. If you logo will appear in your imprint, a one time plate charge of $37.50 will apply to your first order. ru20 6" Half rulers with *one side printed. Imprint area 1/2" x 5 1/2"
ru30 12" Rulers with *one side printed. Imprint area 1/2" x 11 1/2"
*Add $.04 per ruler for an identical second side imprint to both of the above 6" and 12" rulers. A set up charge of $20.00 will apply to all new orders and all repeat yardstick orders. ru40 36" Yardsticks. Price includes both sides printed identically. Imprint area 1/2" x 35 1/2". The rulers and yardsticks on this page are accurate plus or minus 1/32" and are not precision measuring instruments. Union Printed Wooden Rulers and Yardsticks - these Union printed rulers and Union printed yardsticks are made in the USA, and Union printed by American workers.